Web Hosting Firm Just Host hits 100,000 New Hosting Customers This Year! Web Host News – Fareham, UK – Web Hosting firm – Just Host, today announced they just signed up their 100,000th new web hosting customer for this year to date. This remarkable figure was actually Just Host product manager, Sophy Gasson’s target for new web hosting customers for the year, but it’s mid August and her target has already been reached, with 4 months of the year still remaining. [swfobj src=”http://http.cdnlayer.com/findmyhost/Parallels/300x250_money.swf” width=”300/250″ class=”border: 1px solid grey;” align=”right”] Just Host provides low cost, shared web hosting services to a wide range of clients ranging from small business to individuals. 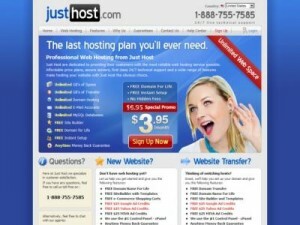 Just Host were believed to have pioneered three very effective hosting features which have lead the way for other hosting companies to follow suit, by offering a free domain name for life, an anytime money back guarantee and unlimited web hosting (unlimited hosting space, unlimited bandwidth, unlimited hosted domains, unlimited email accounts, unlimited databases). Just Host offer web hosting services to the USA, Canada, UK, Australia, Europe and Singapore and have head offices in the US, UK and Australia. Just Host are seen as a industry leading web hosting provider and currently the fastest growing web hosting company in the world. Web Hosting is a relatively new word to many people, but is now seriously big business thanks to owning a website now becoming very popular. Before it used to just be businesses who were searching for web hosting but now everybody is registering their own domains and starting up small sites of their own. Every website needs to be hosted on a server and this is the service that Just Host provides, along with site builders, a library of scripts to help people build their sites and their actual website domain name registration which is included free with just host. Just Host is part of the Just Develop It Group which comprises of over 15 internet based services such as virtual sales agents and web hosting services.